The Rangers fell behind 4-1, roared back to tie the game, but Denis Malgin‘s goal with 1:09 to play gave the Florida Panthers a 5-4 win over the Rangers Tuesday night at The Garden. The loss snapped a four-game winning streak for the Blueshirts and ended their eight-game home winning streak. The Rangers got nine points from the line of Chris Kreider, David Desharnais, and Pavel Buchnevich. New York gave up three goals in the game’s first 16:47, on only six shots, sending goalie Henrik Lundqvist to the bench; he was replaced by Ondrej Pavelec. In the 2nd period, J.T. Miller cut the lead to 3-1 with his 4th goal of the season, at 4:04. But Florida made it a three-goal lead again at 8:36 when Jonathan Huberdeau scored to make it 4-1. That’s when Buchnevich and Kreider came alive. Buchnevich scored at 9:26, off assists from Kreider and Desharnais to make it 4-2. Then Kreider scored at 11:16, off a great pass from Buchnevich, to make it 4-3. The Rangers had a goal by Kevin Hayes in the 2nd period disallowed; the referees said that Rick Nash obstructed Florida goalie James Reimer. Midway through the 3rd period, Kreider scored his 2nd of the game, and 10th of the season, at 13:28, to tie the game 4-4. But, in the closing moments, a turnover by Nick Holden in the New York zone led to Malgin’s game-winner, off a pass from Mark Pysyk, at 18:51. The Rangers were without Mika Zibanejad, who was a late scratch, and captain Ryan McDonagh, out for his 4th straight game with an abdominal strain. Kreider [2G, 1A], Buchnevich [1G, 2A], and Desharnais [3A] each had three points for the Blueshirts. Aleksander Barkov, Jamie McGinn, and Michael Haley scored Florida’s goals in the 1st period. Huberdeau finished with a goal and two assists. The Rangers [now 13-10-2, 28 pts] host the Carolina Hurricanes Friday night at The Garden. 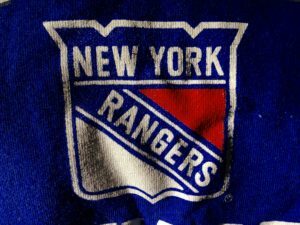 Jimmy Vesey scored the game-tying goal in the 3rd and the game-winning goal in the 7th round of a shootout, as the Rangers beat the Canucks, 4-3, Sunday afternoon at The Garden. It was the team’s 4th straight win, and 8th straight win at home. The Blueshirts never led until Vesey’s game-ending goal, and overcame nearly 40 lackluster minutes of play in the game’s first two periods. The Rangers trailed 2-0 in the closing minutes of the 2nd period when Jesper Fast scored at 17:40 to make it 2-1. Michael Grabner tied the game, 2-2, just 19 seconds into the 3rd period, with his 10th goal of the season. But Vancouver answered 41 seconds later, on a goal by Sam Gagner that made it 3-2 Canucks. A few minutes later, Vesey tied the game. Rick Nash took a pass from Kevin Hayes, was forced to the goal of the net, spun and passed to Vesey, who backhanded the puck past Jacob Markstrom at 5:05 to make it 3-3. Neither team scored in the 5-minute overtime. In the shootout, the Blueshirts elected to go 2nd. Kevin Shattenkirk scored at the end of the 3rd round to keep the game going, and Nash did the same in the 5th round of the shootout. In the 7th round, Henrik Lundqvist stopped Ben Hutton, and Vesey lifted one over Markstrom’s left shoulder for the game-winner. Lundqvist finished with 29 saves. The Rangers only had 11 shots on goal after two periods, and only 20 for the game. The Rangers [now 13-9-2, 28 pts] host the Florida Panthers Tuesday night at The Garden. Mats Zuccarello scored just 37 seconds into overtime, and Henrik Lundqvist made 40 saves, as the Rangers beat the Detroit Red Wings 2-1 Friday night at The Garden. Zuccarello took a beautiful pass from Brady Skjei, skidded to a stop in front of the net, and beat Detroit goalie Jimmy Howard up top for his 4th goal of the season. The Blueshirts have now won 9 of their last 11 games and have won seven straight games at home. Howard was terrific in defeat, stopping 29 of 31 shots. Neither team scored in the 1st period, but the Red Wings were easily the most aggressive team, out-shooting the Blueshirts in the period, 17-6. The Rangers responded in the 2nd period, outshooting the Wings, 16-10, but the two teams were still scoreless after 40 minutes. In the 3rd, with Michael Grabner in the box on a tripping penalty, Tomas Tatar scored a powerplay goal with just :02 left on the penalty – to make it 1-0 Detroit at 4:05. The Rangers answered at the 10:17 mark when Chris Kreider tied the game 1-1, with a backhander that bounced between Howard’s legs for his 9th goal of the season. Lundqvist has been on a tear; in his last four games [3-1-0], he has a 1.02 GAA and a .971 save percentage. The Rangers have gone ten periods without allowing an even-strength goal. Skjei finished the game with two assists. 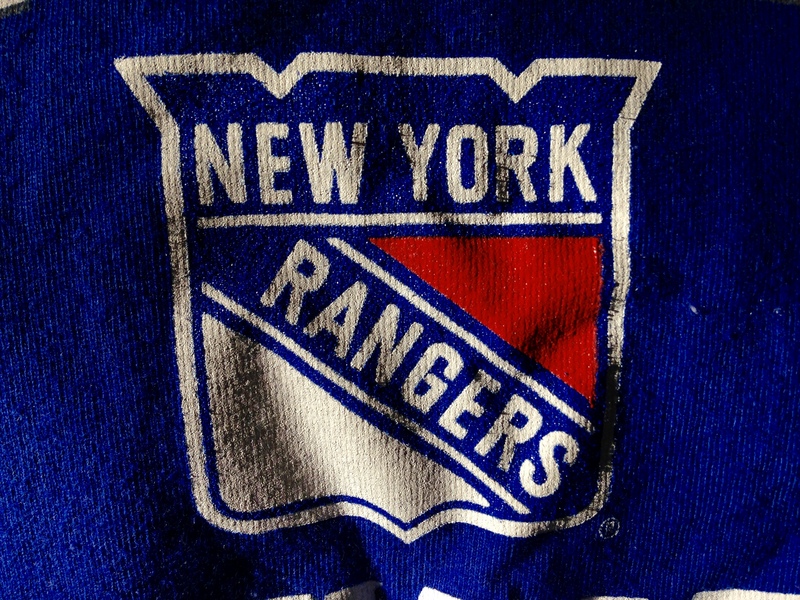 The Rangers [now 12-9-2, 26 pts] host the Vancouver Canucks Sunday afternoon at The Garden. Chris Kreider and Jesper Fast each scored two goals, and the Rangers coasted to their most-lopsided win of the season, beating the Carolina Hurricanes, 6-1, Wednesday night in Raleigh. Henrik Lundqvist made 32 saves for his 10th win of the season. The Rangers are now 8-2 in their last ten games. Kreider and Mika Zibanejad scored in the first 2:26 of the game to stake the Blueshirts to a quick 2-0 lead. Zibanejad’s goal coming on a lob pass into the Hurricanes zone that Carolina goalie Scott Darling completely misplayed. Sebastian Aho cut the lead to 2-1 with a powerplay goal at 8:50, but Paul Carey answered with his first goal of the season at 10:47 that made it 3-1 New York. After a scoreless 2nd period, Kreider made it 4-1 with a powerplay goal just 20 seconds into the 3rd period, and Fast scored twice, at 5:45 and 12:26, for the final 6-1 margin. It was the first two-goal game of Fast’s career. The team played without Ryan McDonagh, who is out with an abdominal strain. As a result, both Brendan Smith and Steve Kampfer dressed for only the second time this season. Each had one assist. Zibanejad finished with a goal and an assist. And J.T. Miller played the 300th game of his NHL career. The Rangers [now 11-9-2, 24 pts] host the Detroit Red Wings Friday night at The Garden. Henrik Lundqvist stopped all 20 shots he faced, and the Rangers’ defense and special teams stood tall during a five-minute stretch in the 3rd period, as the Blueshirts blanked the Ottawa Senators, 3-0, Sunday night at The Garden. The win stopped a two-game losing streak for the Rangers, who have now won 7 of their last 9 games. It was the first meeting between the two teams since their Eastern Conference semi-final series last spring, when the Senators eliminated the Rangers in six games. After a scoreless 1st period, when the Blueshirts had trouble generating shots on Ottawa goaltender Craig Anderson, the Rangers played with more urgency in the 2nd period and took a 1-0 lead 4:48 into the period on Kevin Hayes‘ 5th goal of the season. Michael Grabner made it 2-0 at the 4:52 mark of the 3rd period, deflecting Marc Staal’s slapshot past Anderson. It was Grabner’s 9th of the season. Then came the game’s pivotal moment. Brendan Smith was called for a five-minute interference penalty at 7:32 for sending Ottawa’s Mark Borowiecki crashing into the boards in the Rangers’ zone, and he was also given a game misconduct. Both players were racing into the corner after a loose puck and looked to knock the other out of the way, but Borowiecki was checked off his feet and into the boards. He lay motionless for several moments and was eventually led to the dressing room. He did not return. The incident left the Rangers with a five-minute penalty to kill off, but Lundqvist and the New York penalty kill, helped by the increasingly enthusiastic Garden crowd, managed to keep the Senators from scoring, holding the Sens to one shot-on-goal during the five minutes. The Garden Faithful gave the penalty kill a rousing stand ovation. Mika Zibanejad added a long, 114-foot empty net goal with 2:29 to play, from the far blue line, to make it 3-0. It was Lundqvist’s 9th win of the season and 2nd shutout; he shut out the Montreal Canadiens, 2-0, on October 8th. Mats Zuccarello had two assists. The Rangers [now 10-9-2, 22 pts] play the Carolina Hurricanes Tuesday night in Raleigh. Sergei Bobrovsky stopped all 36 shots he faced Friday night in Columbus, and the Rangers were shut out for the first time this season, losing to the Blue Jackets, 2-0. Zach Werenski and Artemi Panarin scored the goals for Columbus. Henrik Lundqvist made 40 saves. After a scoreless 1st period, Columbus got on the board 13:34 in the 2nd period when Werenski beat Lundqvist with a shot over the goalie’s right shoulder to make it 1-0. In the 3rd, a turnover led to the other Columbus goal. With Pavel Buchnevich in the penalty box on an interference call, Kevin Hayes turned the puck over in the New York end and Panarin’s slapshot would beat Lundqvist at 7:14 for a power play goal that made it 2-0. The Blue Jackets have now won two of the three meetings between the two teams. After being a healthy scratch for six games, Brendan Smith was back in the Rangers’ lineup, playing 14 minutes. The Rangers [now 9-9-2, 20 pts] host the Ottawa Senators Sunday night at The Garden. The Rangers watched a 1-0 lead late in the 2nd period become a 4-1 deficit, thanks to a sloppy five-minute stretch that spanned the end of 2nd and start of 3rd periods and went on to lose to the Blackhawks, 6-3, Wednesday night in Chicago. The loss snapped New York’s six-game winning streak. Artem Anisimov scored a hat trick. Nick Schmaltz and Richard Panik each had three assists. Rick Nash had a goal and an assist for the Blueshirts. The Rangers held a 1-0 lead with about a minute to play in the 2nd period, thanks to Mika Zibanejad‘s 1st period goal, before Alex DeBrincat‘s shot dribbled underneath Henrik Lundqvist and in for a goal and a 1-1 tie. Then, in the first 5:14 of the 3rd period, Chicago got two goals from Anisimov and one from John Hayden to make it 4-1. Lundqvist would be replaced by Ondrej Pavelec shortly afterwards. New York narrowed the game to 4-3 on goals by Kevin Hayes and Nash, but could not score the tying goal. Chicago got another goal from Anisimov [at 16:12] and Jonathan Toews [at 18:30] for the final 6-3 margin. The Rangers [now 9-8-2, 20 pts] play the Blue Jackets Friday night in Columbus. 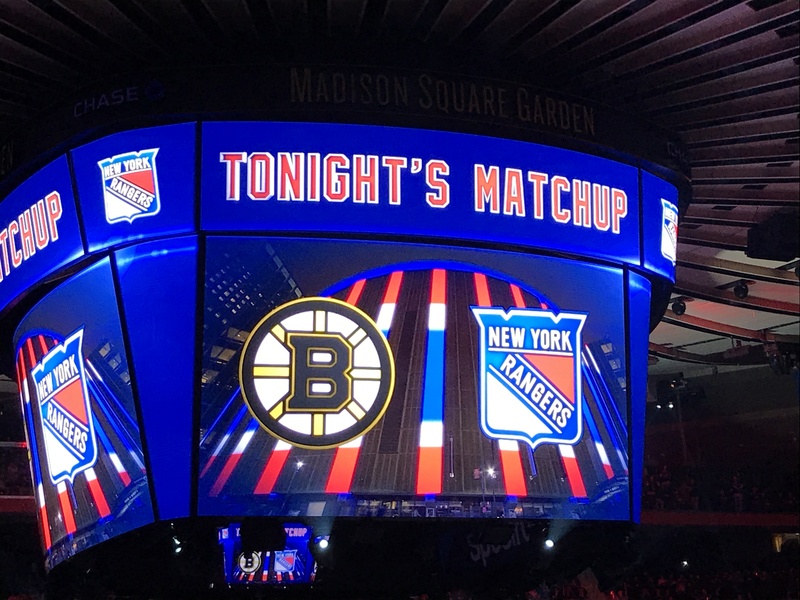 The Rangers scored three goals in the 1st period – including two by Jimmy Vesey in a span of 29 seconds – and Henrik Lundqvist and the Blueshirts defense made the lead hold up, as the Rangers beat the Bruins, 4-2, Wednesday night at The Garden. The win extended New York’s winning streak to five games. The streak is the longest since a six-game win streak last February 2nd-13th, and lifted the team above .500 for the first time this season [8-7-2]. The Rangers came out like gangbusters in the 1st period, playing an aggressive pace and outshooting the Bruins, 16-7. Pavel Buchnevich gave the Rangers a 1-0 lead midway through the period, skating past Zdano Chara and lifting the puck over Tuukka Rask for a goal at 9:53. The lead didn’t last long, as David Pastrnak tied the game just 21 seconds later, putting a rebound past Lundqvist. Later in the 1st, Vesey finished off a furious scramble in front of the Boston net by putting the puck past Rask at 14:41 for a 2-1 New York lead. He scored again 29 seconds later, finessing a rebound from the side of the net and past Rask for a 3-1 Blueshirts lead. Neither team scored in the 2nd period. In the 3rd, Patrice Bergeron made it a one-goal lead, outdueling Nick Holden and Ryan McDonagh in front of the net, and scoring his 3rd goal of the season at the 6:44 mark. But Rick Nash‘s empty net goal with 8 seconds to play provided the breathing room and the 4-2 final margin. The Rangers penalty kill stopped all four Boston power play chances. Mats Zuccarello played his 400th career NHL game. The Rangers [now 8-7-2, 18 pts] host the Edmonton Oilers Saturday afternoon at The Garden. The Rangers used three power play goals in the 3rd period to come-from-behind and beat the Columbus Blue Jackets, 5-3, Monday night at The Garden. The win extended the team’s winning streak to four games, and raised the Blueshirts’ record to .500 [7-7-2] for the first time this season. After a scoreless 1st period, Columbus took a 1-0 lead in the first minute of the 2nd period, as Artemi Panarin scored just 38 seconds in. Panarin took a pass from Zach Werenski, who was behind the Rangers’ goal, and scored his 2nd goal of the season. Josh Anderson would make it 2-0 at the 4:24 mark of the period, beating Lundqvist with a wrist shot to Lundqvist’s stick side, to make it 2-0 Blue Jackets. The Rangers got one back midway through the 2nd period when Michael Grabner took a pass from J.T. Miller and pushed the puck past Sergei Bobrovsky at 12:41 to make it 2-1. It was Grabner’s 6th goal of the season. In the 3rd period, Kevin Shattenkirk continued his torrid pace of late, scoring a power play goal at 5:10 to tie the game, 2-2. Shattenkirk has a five game point-scoring streak [3 G, 5 A]. The Blue Jackets got the lead back at 8:01 when Oliver Bjorkstrand scored, off assists from Brandon Dubinsky and Boone Jenner, to make it 3-2. But Chris Kreider would answer, tying it, 3-3, with a power play goal 99 seconds later, at 9:40, scoring on a rebound. It was his 5th goal of the season. The Blueshirts then took their first lead of the night at 11:27 when they scored their third power play goal of the period. Pavel Buchnevich, off a pretty pass from Mika Zibanejad, scored to make it 4-3. Grabner scored an empty-netter at 19:11 for the final 5-3 margin. It was Grabner’s 2nd goal of the night and 7th of the season. He has six goals in the last six games. Zibanejad had three assists, and leads the Rangers with 17 points on the season [8 G, 9 A]. Lundqvist made 22 saves for his 6th win of the season. The Rangers scored three power play goals in a game for the first time since March 9th, 2017 at Carolina. Before the game, the team saluted Rick Nash, who recently played the 1,000th game of his NHL career. The Rangers [now 7-7-2, 16 pts] host the Boston Bruins Wednesday night at The Garden. J.T. Miller streaked over the blue line, swooped in on goal from the right side, skated past Andrei Vasilevskiy, and then beat the Tampa goalie from an extreme angle on the left, giving the Blueshirts a 2-1 overtime win over the Lightning Thursday night in Tampa. It was New York’s first road win of 2017-18, and gave the Blueshirts back-to-back wins for the first time this season. The Lightning came into the game with a 10-2-1 mark, tied with St. Louis for best record in the NHL. Miller’s goal, 1:19 into the overtime, put an end to a goaltending duel between Henrik Lundqvist and Vasilevskiy. Lundqvist stopped 27 of 28 shots, and Vasilevskiy made 33 saves. Chris Kreider gave the Rangers a 1-0 lead with 1:26 to go in the 1st period, off an assist from Mika Zibanejad; Kreider now has three goals in the last four games. Yanni Gourde got the only Lightning goal, off a pass from Victor Hedman, at the 11:00 mark of the 2nd period, to make it 1-1. Tampa thought they had scored the go-ahead goal minutes into the 3rd period, when J.T. Brown scored, but the goal was waved off for goaltender interference. The game was played with mid-season-level intensity. Steven Kampfer, usually not the bruiser, racked up two fighting penalties, the first two fights of his NHL career. The Rangers [now 5-7-2, 12 pts] play the Florida Panthers in Sunrise, FL, Saturday night.